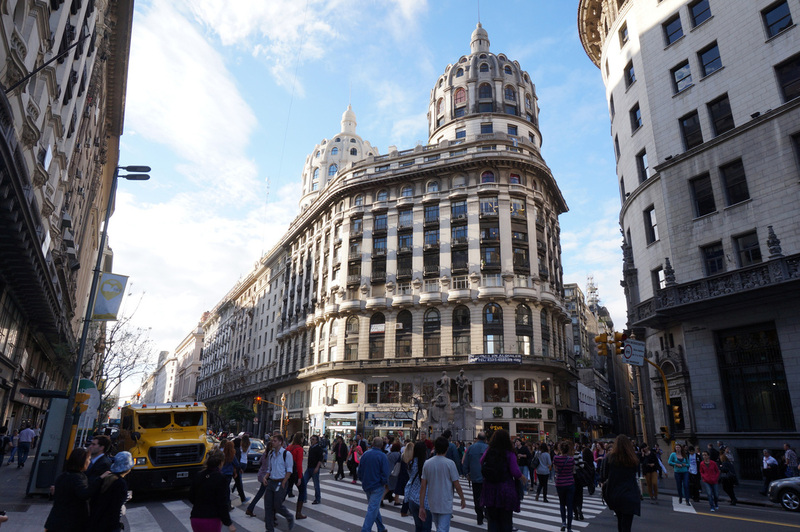 San Telmo may be the historical heart of the city, however, the area between Recoleta and Retiro in the North to Plaza de Mayo and Monserrat is where all of the current action takes place. 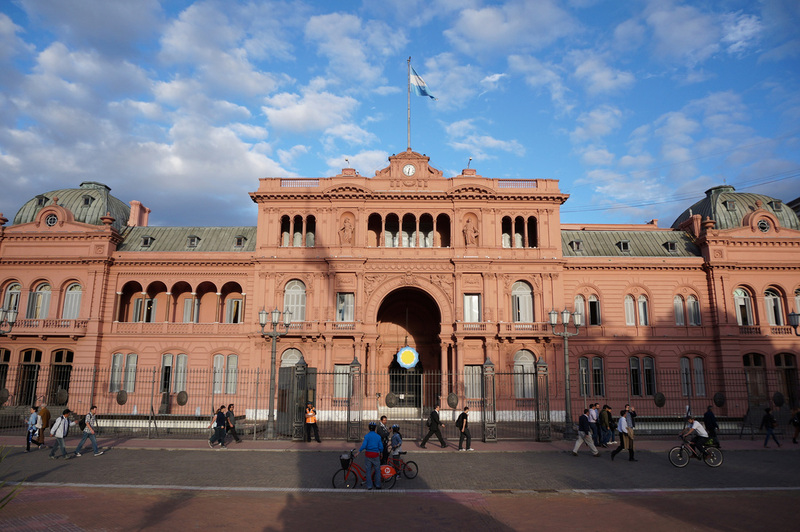 This area is home to wide boulevards, a famous cemetery, an arts and opera district, and the Casa Rosada, Argentina's executive mansion. If you only have a few days in the city, basing yourself here puts you in the middle of the action - you are within walking distance of San Telmo, a short cab ride to Palermo, and metro routes can take you to farther destinations. The major East / West thoroughfares of Santa Fe, Cordoba, Corrientes, Rivadavia, and Belgrano and the North / South thoroughfares of Avenue 9 de Julio, Callao, and Pueyrrdeon provide blocks upon blocks of entertaining street scenes and activities. Somewhat disappointing is the lack of open air cafes, particularly along Avenue 9 de Julio. You're in the middle of the activity, unfortunately there's few places to sit and watch from the outside. 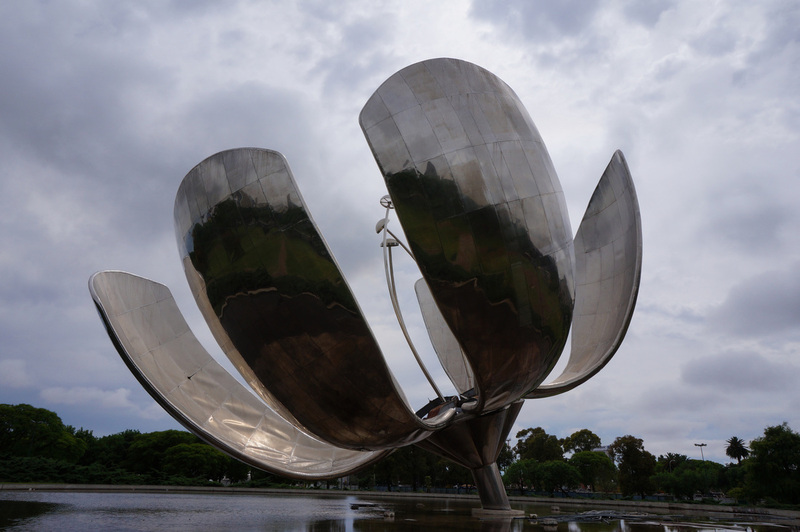 On the Northside of Recoleta is a badass flower sculpture called Floralis Generica. At certain times of the day the flower opens and closes - at full bloom, in the middle of the day, it makes for an impressive site. There's not much else around. The sculpture is in a park almost a thirty minute walk from La Recoleta Cemetery. 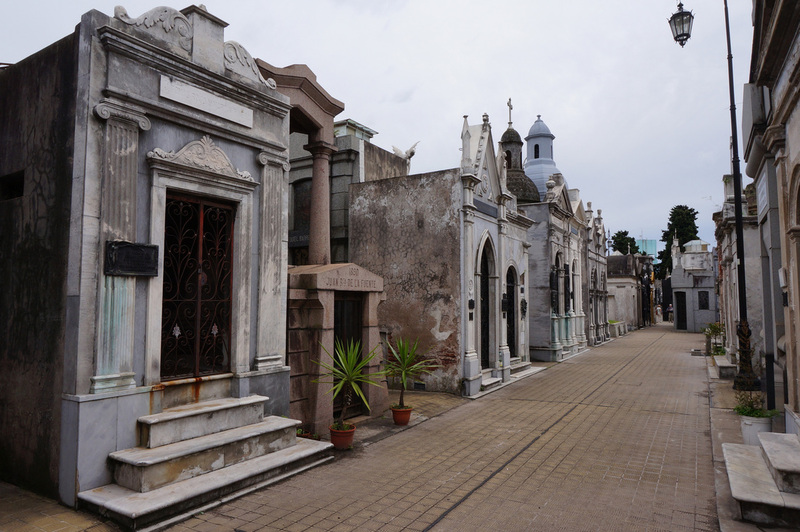 La Recoleta Cemetery is one of Buenos Aires' famous sites and the final resting spot of many famous Portenos, including Eva Peron. Each grave site features a mini-mausoleum some of which you can enter. Be sure to pick up a map at the entrance area which includes a suggested walking path. 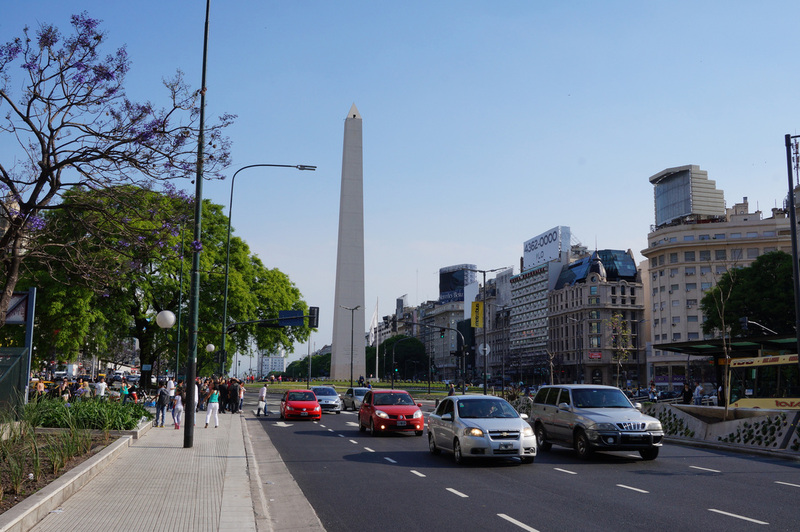 Avenue 9 de Julio, honoring Argentina's 1816 independence day, is an EIGHTEEN lane thoroughfare that's wider than a city block. It will take several walk signs to make a crossing. Justin Beiber was in town when I visited and there was a crowd outside his hotel - other than that the northern stretch of this road is relatively quiet...except for all the cars. Once I crossed below Cordoba there's a little more activity and historical sites such as the Teatro Colon, one of the world's great opera houses. 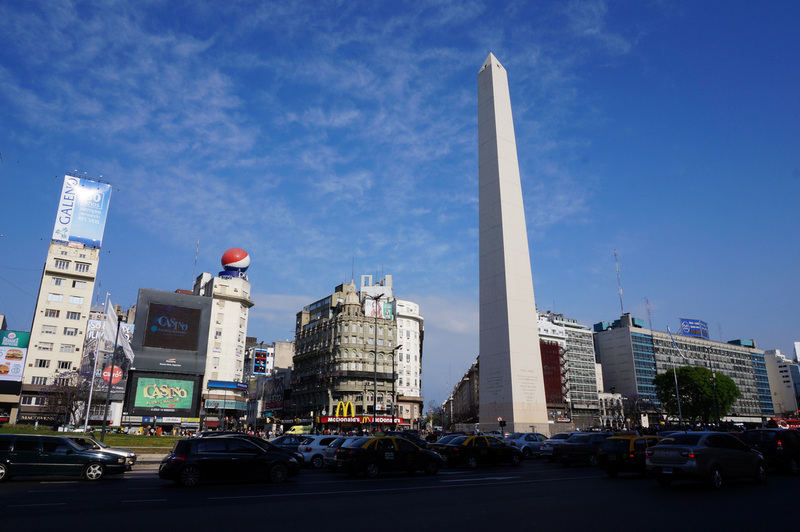 El Obelisco stands in the intersection with Avenue Corrientes. It's a smaller version of the Washington Monument and there is no access to ascend to the top. I found an outdoor cafe on the northwest side of Avenue Pres. Roque Saenz Pena that provided views of El Obelisco. The southeast side of Avenue Pres. Roque Saenz Pena leads to Casa Rosada. When I visited a wall separated Plaza de Mayo from Casa Rosada. Protesters were camped out in Plaza de Mayo and while most seemed like harmless, unemployed college students, a few had a little more fervor. There are a few buildings in this area that maybe, kind of, sort of look like they belong in Paris...but they also look like they could belong in Milan or other major European cities. The area definitely has more of a European feel than other Spanish colonial capitals such as Santiago, Bogota, or Quito. For all the historical grandeur the most impressive building and a must stop is El Ateneo Grand Splendid. 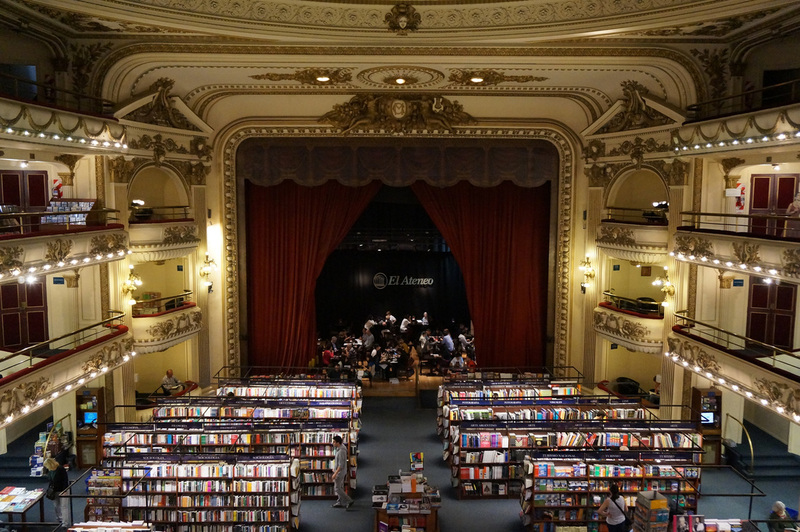 The theater converted to a book store was one of the most memorable shopping experiences from the past year and you shouldn't leave Buenos Aires without at least a quick pop in or consider getting a cappuccino from the cafe that's located on the former stage. The book store is on Avenue Santa Fe, just west of Callao. 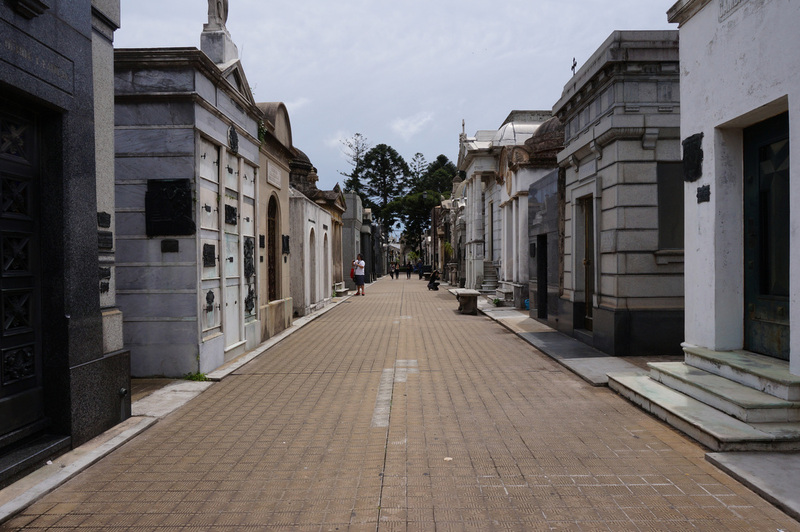 It's a fifteen minute walk south from Recoleta. I thought this section of the city was also a good place to unwind or take a break. With all the walking there's a few cafes and restaurants in the area that are enjoyable stops. The most famous restaurant is Cafe Tortoni - I walked by saw the line, then kept on walking to 36 Billares, a few blocks west on Avenue de Mayo. 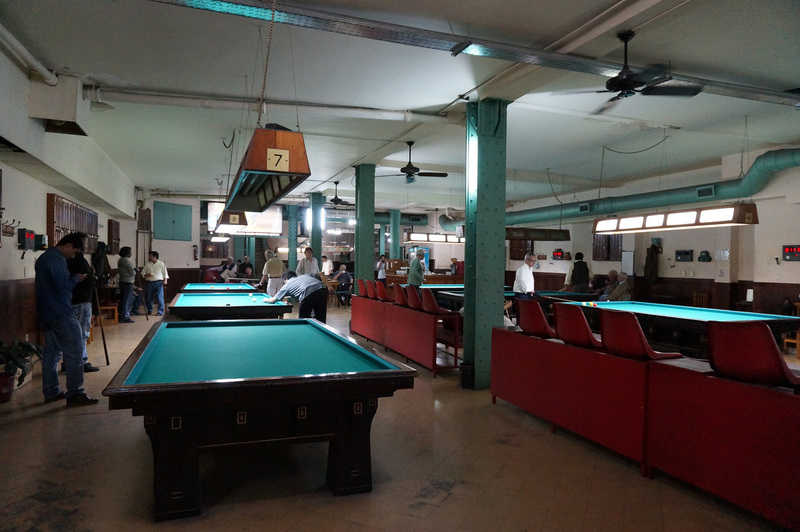 The basement of this cafe contains a few pool tables where retirees were busy spending their afternoons. At night the Corrientes area west of Avenue 9 de Julio fills up with concert and theater attendees. People are dressed up as though are part of the cast appearing at a Hollywood Red Carpet premiere. 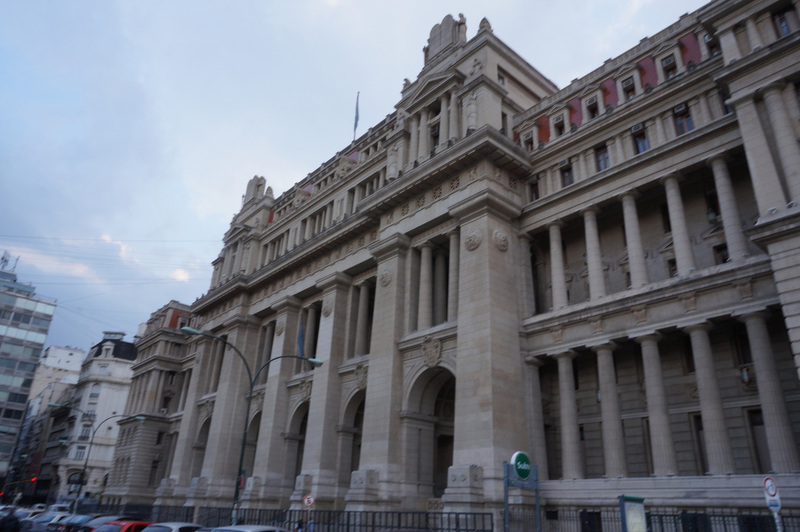 For additional Recoleta / Plaza de Mayo photos see FLICKR ALBUM.